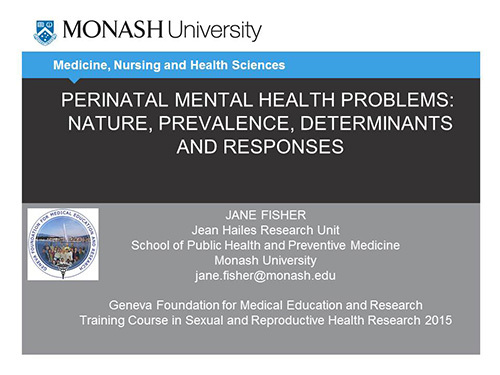 Fisher J. Perinatal mental health problems: nature, prevalence, determinants and responses. Paper presented at: Training Course in Sexual and Reproductive Health Research; 2015 Jun 12; Geneva. Fisher J, Cabral de Mello M, Patel V, Rahman A, Tran T, Holton S, Holmes W. Prevalence and determinants of common perinatal mental disorders in women in low- and lower-middle-income countries: a systematic review. Bull World Health Organ. 2012 Feb 1;90(2):139G–149G. Rahman A, Fisher J, Bower P, Luchters S, Tran T, Yasamy MT, Saxena S, Waheed W. Interventions for common perinatal mental disorders in women in low- and middle-income countries: a systematic review and meta-analysis. Bull World Health Organ. 2013 Aug 1;91(8):593–601I.